Discussion in 'The Small Company Luthiers' started by TRIODEROB, Aug 4, 2008. Looks like a womans hair. 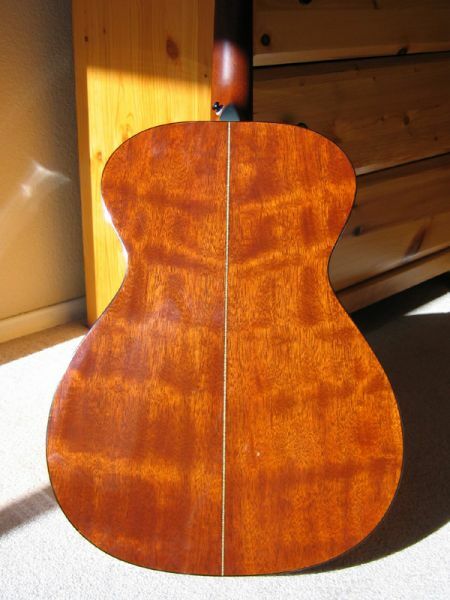 I recently completed a guitar that featured an "Ancient Kauri" top...I was pleasantly surprised by the resonant characteristics of that wood, which was very useable for the purposes of the project at hand, and was a success. The wood is verifiably "the oldest wood in the world", and as such is very cool! I have enjoyed working with it. I would not have bothered with it, but my client pointed me in that direction. It just happened to have worked. I have only built one guitar with this wood. As such, I am NO expert as regards Kauri. From my experience...Ancient Kauri (20,000-35,000 years old) is potentially cool to work with. But modern wood is variable enough as regard tonal characteristics. I have had a great experience with this wood, but that may have been luck. I have built one successful guitar using this wood....the same rules apply as regards judging wood for a given purpose...I ordered one measly sample, and it was perfect for the project...people, that was pure luck. I will be playing with this material some more. The charcteristics of this wood, in general, are unknown to me, altho I have built one guitar with it. Potentially GREAT stuff. I will leave it to others to offer it as a standard item at this time. For me...too untested....but intriguing. I do not know how to gauge the raw material yet., and trying to sell it on some sort of "story" or "legend" alone would be dishonest and wrong, IMO. In the hands of a very experienced luthier, who has inspected that actual board to be used on your guitar, and who loves it.....your call. Reminds me of my '88 Taylor 512, which has very wide curl on the mahogany back, but not nearly as intense as the one in the OP. 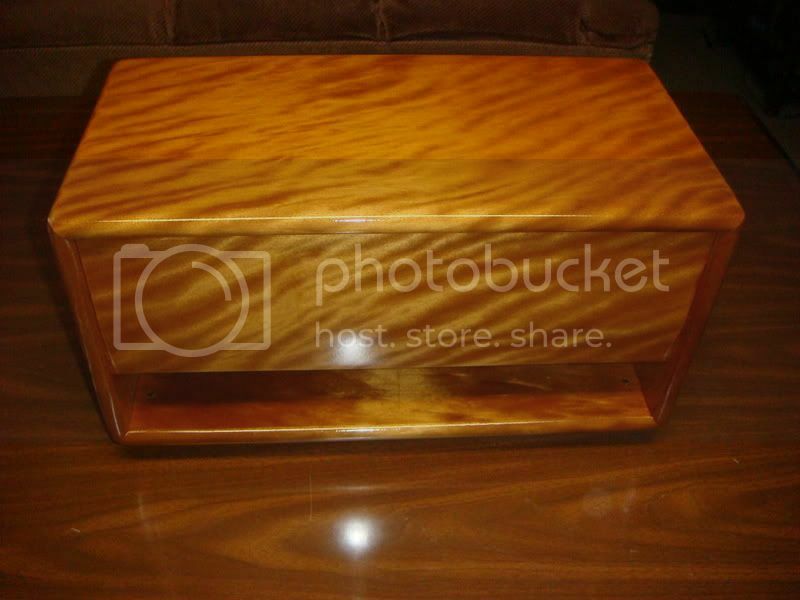 Below is a picture of one of two head cabinets I built out of Kauri. One ended up ui Australia and the other went to Norway. The wood was very interesting to work with and really came alive when sanded with very fine grit sandpaper. These were progressively sanded up to 1200 grit. At this level the figure lust comes alive. The thing that really surprised me was the wood was exceptionally soft. With a piece of wood anywhere between 30,000 and 50,000 years old I thought it would be extremely hard..
That's just beautiful wood, absolutely amazing! Those pieces are absolutely incredible! But how is this wood harvested? I sure hope they're not cutting down 50,000 year old trees to sell the wood for material goods... If they fell naturally, by all means, make use of it in the best manor possible! It's one thing to make a guitar or cab out of spruce, mahogany, maple, ash, etc which will grow back in a relatively short period of time and can be sustainably grown and managed, but 50,000 year old wood? Man, I hope they're being responsible with that stuff. Silly. Not even trees live that long. It's old logs that have been buried. The Langcaster strats are made of the same material no? I believe its harvested from swamps/forests/fallen trees in New Zealand. DC1's exactly right. Bristlecone Pines, the oldest living thing on the planet, are around 5,000-6,000 years old. 30,000-50,000 years old - those aren't a fresh harvest. Sure is beautiful grain, huh? Truly amazing wood! That's gotta be the wildest, & widest figure I've seen! Generally I'm not much into foo foo figure, but I may have to rethink my position! Ya, that's at least 7 finger flame!! Yeah, have you played this baby yet, or are you looking at pics from a third party? That is beautiful! I would love to have a guitar with a top like that. I don't know how much is wood and how much design, but Laurie Williams makes some outstanding guitars using this stuff. They have a distictive sound that I wouldn't be able to compare with more traditional tone woods. That's some of the figure that appears in a very small amount of Kauri wood. The more common figure, however is called "Whitebait" after a local bait fish; the figure in the wood suggesting an overhead view of a school of the fish swimming in open water. (pic below). With a tree of this size, when you get figure like compression curl or flame, it would be rather large flame, as exemplified by the Laurie Williams acoustic in the OP.